App Service provides built-in Docker images on Linux with support for specific versions, such as PHP 7.0 and Node.js 4.5. 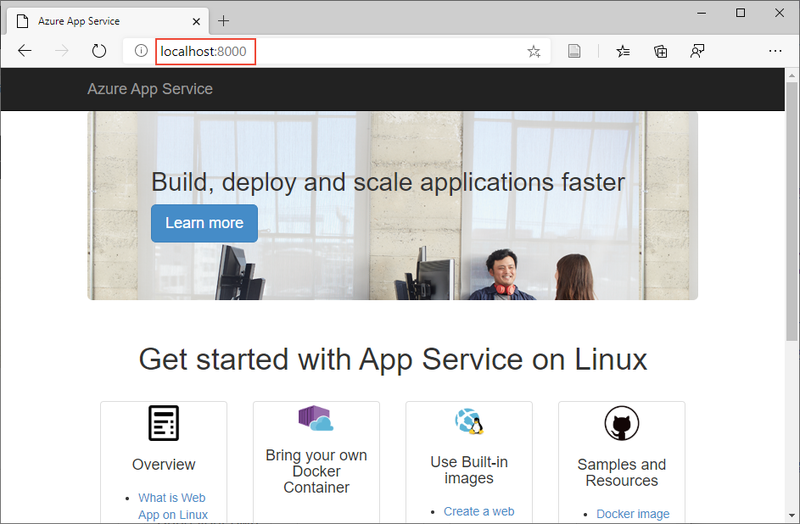 App Service uses the Docker container technology to host both built-in images and custom images as a platform as a service. In this tutorial, you learn how to build a custom image and run it in App Service. This pattern is useful when the built-in images don't include your language of choice, or when your application requires a specific configuration that isn't provided within the built-in images. In a terminal window, run the following command to clone the sample app repository to your local machine, then change to the directory that contains the sample code. In the Git repository, take a look at Dockerfile. This file describes the Python environment that is required to run your application. Additionally, the image sets up an SSH server for secure communication between the container and the host. Build the Docker image with the docker build command. docker build --tag mydockerimage . Test that the build works by running the Docker container. Issue the docker run command and pass the name and tag of the image to it. Be sure to specify the port using the -p argument. Verify the web app and container are functioning correctly by browsing to http://localhost:8000. To create an app that uses the image you just created, you run Azure CLI commands that create a resource group, pushes the image, and then creates the App Service plan web app to run it. In the Cloud Shell, create a resource group with the az group create command. The following example creates a resource group named myResourceGroup in the West Europe location. To see all supported locations for App Service on Linux in Basic tier, run the az appservice list-locations --sku B1 --linux-workers-enabled command. In the Cloud Shell, use the az acr create command to create an Azure Container Registry. To push an image to the registry, you need to authenticate with the private registry. In the Cloud Shell, use the az acr show command to retrieve the credentials from the registry you created. The output reveals two passwords along with the user name. From your local terminal window, sign in to the Azure Container Registry using the docker login command, as shown in the following example. Replace <azure-container-registry-name> and <registry-username> with values for your registry. When prompted, type in one of the passwords from the previous step. Confirm that the login succeeds. Push the image by using the docker push command. Tag the image with the name of the registry, followed by your image name and tag. Back in the Cloud Shell, verify that the push is successful. In the Cloud Shell, create a web app in the myAppServicePlan App Service plan with the az webapp create command. Replace <app-name> with a unique app name, and <azure-container-registry-name> with your registry name. For App Service to pull the private image, it needs information about your registry and image. In the Cloud Shell, provide them with the az webapp config container set command. Replace <app-name>, <azure-container-registry-name>, <registry-username>, and <password>. When using a registry other than Docker Hub, --docker-registry-server-url must be formatted as https:// followed by the fully qualified domain name of the registry. Most Docker images use custom environment variables, such as a port other than 80. You tell App Service about the port that your image uses by using the WEBSITES_PORT app setting. The GitHub page for the Python sample in this tutorial shows that you need to set WEBSITES_PORT to 8000. To set app settings, use the az webapp config appsettings set command in the Cloud Shell. App settings are case-sensitive and space-separated. Verify that the web app works by browsing to it (http://<app-name>.azurewebsites.net). The first time you access the app, it may take some time because App Service needs to pull the entire image. If the browser times out, just refresh the page. In your local Git repository, open app/templates/app/index.html. Locate the first HTML element and change it to. Once you've modified the Python file and saved it, you must rebuild and push the new Docker image. Then restart the web app for the changes to take effect. Use the same commands that you have previously used in this tutorial. 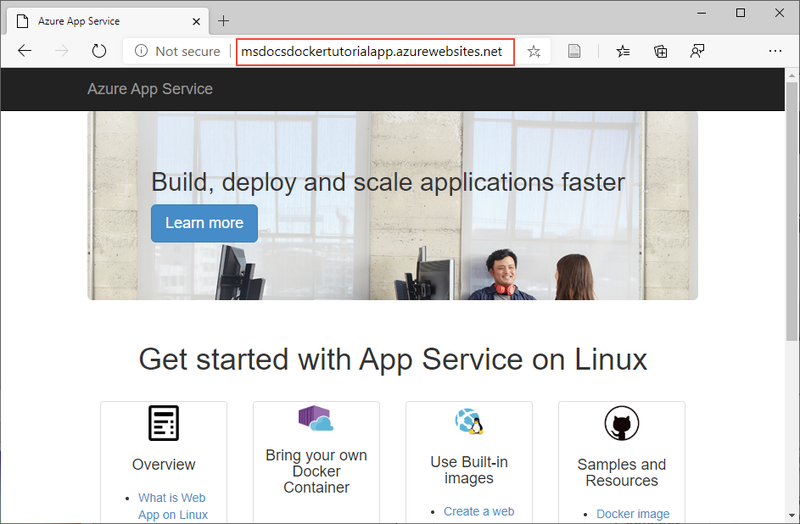 You can refer to Build the image from the Docker file and Push image to Azure Container Registry. Test the web app by following the instructions in Test the web app. If you don't see console logs immediately, check again in 30 seconds. You can also inspect the log files from the browser at https://<app-name>.scm.azurewebsites.net/api/logs/docker. To stop log streaming at any time, type Ctrl+C. SSH enables secure communication between a container and a client. To enable SSH connection to your container, your custom image must be configured for it. Let's take a look at the sample repository that already has the necessary configuration. In the Dockerfile, the following code installs the SSH server and also sets the sign-in credentials. This configuration does not allow external connections to the container. SSH is available only through the Kudu/SCM Site. The Kudu/SCM site is authenticated with your Azure account. The Dockerfile copies the [sshd_config](https://github.com/Azure-Samples/docker-django-webapp-linux/blob/master/sshd_config file in the repository) to the /etc/ssh/ directory. The Dockerfile exposes port 2222 in the container. It is an internal port accessible only by containers within the bridge network of a private virtual network. The entry script starts the SSH server. SSH connection is available only through the Kudu site, which is accessible at https://<app-name>.scm.azurewebsites.net. To connect, browse to https://<app-name>.scm.azurewebsites.net/webssh/host and sign in with your Azure account. You are then redirected to a page displaying an interactive console. You may wish to verify that certain applications are running in the container. To inspect the container and verify running processes, issue the top command at the prompt. The top command exposes all running processes in a container. Congratulations! You've configured a custom Linux container in App Service.